Writing is nothing but a passion, a way to convey your ideas and thoughts to the world, and a medium to demonstrate your knowledge and expertise on a range of topics before a certain audience. Most of the people do writing for themselves just because they like it to give shape to what flows in their mind. But won’t it be better to let the world know you and get benefited from what you’ve learned through your experiences or what do you think about the things that matter. Further, it also gives you the opportunity to know about something you’ve been unaware of and come in touch with those who would influence you in a good way. The Internet and technology have given writers the most easy and convenient way to express their thoughts with public in no time. But as with everything, having the resources is just not enough, you do need to be well aware of the tactics and able to capitalize the strategy to get most from it. This is the main challenge that most of the budding and skilled writers face nowadays despite tirelessly working on their content. Though they have all the knowledge to share but their lack of understanding about the tricks of using the Internet in their favor hurts them the most, resulting in even extinction of a promising talent. Now, if you’re good enough at writing and ready to mesmerize the world with your talent, all you’ve to do is just get your content popular among people. This can only be done by generating more “traffic” to your content on the Internet and to do this you must be attentive to such resources that can help you in the process. Quora is one such source of generating traffic for writers and bloggers. Quora is a Q&A platform started in 2009, which gets most of its traffic from India and the US. Answering regularly to the questions put at the forum can continue to drive traffic. According to SimilarWeb, Quora received over 300 million visitors in August 2016. The traffic potential of Quora with around 1-2 million monthly visitors all over the world can be a boon for those who are new to blogging or writing. Using Quora effectively can drive tons of highly targeted traffic to your content with a very low bounce rate – the best thing that makes Quora stand apart. With this article, I am here to offer some useful tips for such writers on how to use Quora effectively to drive traffic to their blog. There’s a simple three-step strategy to dominate Quora and start driving traffic to your blog. First of all you need to create a complete and professional profile of yourself on Quora to reflect your area of expertise and to stand out from the rest of other writers out there. You should consider linking it with a few of your social profiles. You can also put the “headline” hinting the audience that you’re qualified enough to answer the questions. Add relevant topics to your profile to highlight the most relevant aspects of your experience. This will surely help you get views. After setting up the profile, you should get the right questions to appear on your feed which can easily be done by subscribing to the categories you’re confident about and want to read and write about. It could be anything that interests you the most from vocational guidance to entrepreneurship, academic to business consultation, or general awareness to critical thinking. Answer questions with helpful advice and link back to your blog. The most popular way to get Quora traffic is writing a sincere, awesome answer to the question. You can include images or videos in relevant answers. According to a study by Buzzsumo, answers with an image doubles the number of views of articles with fewer images. Asking a question and then answering it is a good strategy to drive a good amount of traffic to your blog. You’re recommended to track the traffic coming from your answers on Google Analytics. If you have started to use Quora to drive traffic for your content, you are required to get yourself engaged in the ongoing discussion, communicate with others and answer the questions. Above all, the best way to keep the audience engaged is not to bore them and being interesting and inspiring too. Lastly, don’t forget to mention other writers who have already answered the question as this is gonna help you attain top writer status and a better chance of being spotted by the group who are in the hunt of top Quora writers. It allows you to help readers with the problems they are dealing with, and sometimes helps you too in finding answers from experts for what you’ve been looking for. 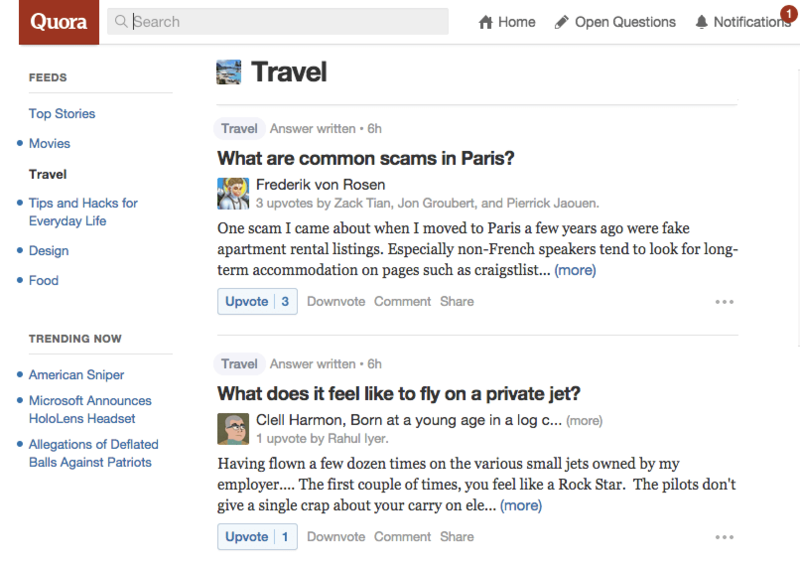 It also allows publishing your own blog on Quora (called Quora Blog Post) along with providing answers. Posting regularly on Quora maintains your ranking as a writer which lets you establish yourself as an authority and develop your credibility as a writer whom people can approach for expertise. Regular and efficient writing on Quora gives you a very good chance of being featured on sites like Forbes and even get selected by major publications that source content directly from Quora and publish them verbatim on their websites for reference. Quora is a knowledge sharing community. By following certain tactics you can considerably increase your chances of success and drive more traffic to your content. So, if you’ve the zeal of writing with the aim of helping people with your expertise but struggling to get your voice heard, Quora is one of the best sources of driving high-quality traffic on the internet. It’s the platform for people who love to write.